Offered as part of the Autumn 2011 Collection in Perfume and Ganache. Description: Thornwood Thicket is a blend of blackberry, black agarwood, aloeswood, sweet and smokey guaiacwood and golden amber. It starts out more powerfully blackberry with a small touch of a grape note, but it doesn't take long for that to tone down and the woods to softly come out. The wood components do get stronger over time, especially after it has been on the skin for a while. The blackberry has tremendous staying power, though it does take a back seat to the woods. There is no fake berry smell here on the dry down but rather a dark, rich berry note coupled with exotic incensey woods. This is a very nice morpher and one that begs for a skin test (do not judge it on cold sniff as the true delicious blackberry note is not as apparent this way!). I was afraid to try this scent, since I'm really not a fruity or foody scent type of person. Angela kept remarking to me about how wonderful the drydown of this scent was. Upon opening and taking a whiff, there is a strong scent of blackberries... almost a grape scent. Behind it, you can faintly smell the incense in the background. I hesitated trying it because I'm really not fond of berry smells. 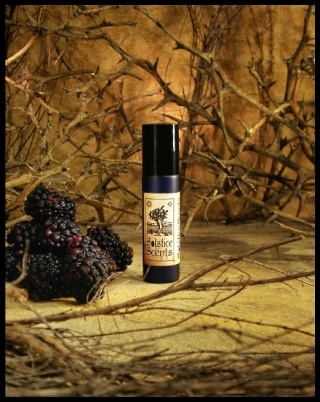 The scent starts out the same way on my skin... very berry and very grape. The drydown still contains the berry note, but the incense does become stronger. Angela had told me it reminds her of the berry incense from years ago, and she's totally right, it does! After it was on for a few hours, I started to tire of the berry. It did fade a bit to the background, but was still strong enough to be a tad bit too much for me. At the end of the day, it did tone way down and it was a great combination of berry and incense. Trying this scent, I found that I really am not a lover of wearing berry. Even though it was a nice combination, sadly it's not really something that I would want to wear day after day. It will probably be much better received by people who are more into the fruity scents. I started off thinking this was going to be the perfume I don't like. At first sniff I thought it was way too sweet. Too many sweet berries for my liking. But it dries down into something very interesting and surprising. A woodsy and golden rich smell takes over, the berries linger in the background. Not my favourite, but very good for daywear and when in a sweeter mood. Really nice. Since I tend to not like fruity scents, I wasn't sure if I'd like this one. Most berry fragrances I dislike because of them being too artificial. Straight out of the vial, Thicket is very berry with not much else going on. After a while on the skin, though, the berry recedes into the background and the woods come out to play. I wasn't overly fond of it when I first put it on, but when the woods come out I really quite like it. I think this one will be reserved for when I'm in the mood for something on the sweeter side. When I first got a sample of Thornwood Thicket, the blackberry was overwhelming and this smelled intensely of grape flavored cough syrup on my skin (medicinal, bitter - not good times). Now that I've had the sample for a few weeks, more of the smoky, dark, resinous woods feel is coming out, but there's still that lingering grape cough syrup smell that makes this unwearable for me. The blackberry note in this is not playing nice on me, sadly. It sounds like I may be in the minority, but I like the sparkling berry top note. My favorite phase, though, is the drydown where it becomes a smooth gold and deep purple tapestry. Lovely! Berries, berries, berries! And is that a hint of grape?? - At least, that was my first impression with this one. As others have said, when it tames down, the berry scent mellows into the background. This is a fun scent! Definitely something to where when you're feeling in a chipper mood! Today I pulled out Thornwood Thicket to wear..I applied it and left to run a few errands. My first stop was at the grocery store. I went to the little Starbucks area to get a drink and soon heard the two girls who were working say that something smelled really good. One also mentioned the word incense. I immediately knew it was me becuase no one else was around. I didn't say anything at the time but I wish I had! This perfume has the greatest start up for me. It comes up a wonderful dark smokey woods, like the notes of black agarwood, aloeswood, and guaiacwood decided to have a big party on my wrist. Later on, the berry pops out and it gets strong with the drydown. It goes all Yankee candle on me, like a good smelling berry candle. I prefer berry like that in candle form, on the skin, it's a bit much! I have a sample I will treasure and I did want this one to be a bottle purchase once I made up my mind about Yule, but I don't think I would use the bottle because of the berry coming out so sweet and loud at the end. I adore this scent. I love dark berry scents as well as resinous and smoky scents. They say 3 is the magic number, and that is true. All three of the scents swirl together in this fragrance and create magic. I detect plump blackberries, woodsmoke, and sweet resinous amber. Autumn perfection once again!!!! Unfortunately, I'm part of the group that got grape cough syrup from this scent. "Thornwood Thicket smells like the lovechild of artificial grape and Dayquil/Nyquil. If anyone has ever had the misfortune of forcing down Dayquil/Nyquil, which I had while sick with the flu around the time this stuff arrived, you must instantly know via osmosis between our damaged souls that I don't like this scent as a result. Generally, I really love berry scents, so this was a major disappointment for me." I'm a foodie person and I don't count cough syrup to be foodie, so yeah... no love from me. This scent was also really strong and in your face, which may be a good thing if you like it. Lasting power was very good. This and Blackburn's Farmstead were my biggest disappointments from my first order of samples as berry scents usually smell delicious on my skin. I am totally in love with this perfume. When I first put it on it reminds me of Grape Soda...which I love! After a while I get the smokey, woodsy background. I have been constantly applying it, and smelling myself. I dare say this is my new SS favorite. Hope it returns next Autumn! Edit: I've worn this blend for a couple of days in a row and i finally realized what bothered me about it - it's the aloeswood that had that funk or kick and ticked me off for a while. It requires some time for it to go away. My lack of technological prowess meant that I created two reviews in error. Please see my final review next. I have an odd relationship with how Thornwood Thicket reacts with me. Some days it smells as though the fruit notes dominate and it is very sweet, other days the wood dominates and it is more 'thicket' like. I most definitely prefer when the wood is strongest. Either way I find the opening note disconcerting. I know some people describe it as "grape". To me it is bitter in a biological way that initially put me off. It lasts about two minutes on me before it fades and the fruit/wood combination emerges. So if like me you the opening is not what you expect, do persevere as once that top note dissipates, it becomes a most delightful wood and blackberry fragrance that is very attractive and has garnered several compliments. Like many complex fragrances, Thornwood Thicket gets mixed reactions from reviewers. Unlike many Solstice Scents products which are like a painting of a scene or location; Thornwood Thicket strikes me as a little more abstract than hyper-realistic. It has both elements of comfort and elements that many people don't expect. Aloes Wood and incense are the background and skeins of blackberry weave through the canvas in what has turned out to be quite a challenging manner for many people. My guess is that the Aloes Wood is pulling the blackberry note slightly away from familiar territory and that is what some people find disconcerting. It is simply not a naturally simple blackberry. Angela has also done this sleight of hand in Black Forest, where she pulls the cherry cocoa notes towards the wood as well. It is long lasting (about six hours) and has moderate sillage. While it is on the sweet side because of the fruits, it is far from being a mere fruit scent as the woods and incense add complexity. Well worth trying if you like interesting fragrances. Like many complex fragrances, Thornwood Thicket gets mixed reactions from reviewers. Unlike many Solstice Scents products which are like a painting of a scene or location; Thornwood Thicket strikes me as a little more abstract than hyper-realistic. It has both elements of comfort and elements that many people don't expect. Aloes Wood, Guiac wood and Amber are the background and skeins of blackberry weave through the canvas in what has turned out to be quite a challenging manner for many people. My guess is that the Aloes Wood is pulling the blackberry note slightly away from familiar territory and that is what some people find disconcerting. It is simply not a naturally simple blackberry. Angela has also done this sleight of hand in Black Forest, where she pulls the cherry cocoa notes towards the wood as well. It is long lasting (about six hours) and has moderate sillage. While it is on the sweet side because of the fruit and amber, it is far from being a mere fruit scent as the woods add unexpected complexity. Well worth trying if you like interesting fragrances, just don't approach it as a fruit scent. This scent is fascinating to me. It's almost like Manor with a blackberry top note, but less sweet than that sounds. It starts off very berry-heavy, but that dries down quickly to the black agarwood (I only can tell that's what it is because, again, of how similar it is to Manor.) The top-note lingers and never quite disappears, but mixes in with the woods creating a complex scent with so much depth. After a few hours most of the berry is gone, and what's left is sweet, musky wood. This one is gorgeous and definitely worth a sample! Very nice. Not as sweet BlackBerry as I expected, more of a smoky/Woody BlackBerry. BlackBerry fades over time. Might need a bottle of this one.